Analyzing Shakespeare's views on theatre and magic and John Dee's concerns with philosophy and magic in the light of the Italian version of philosophia perennis (mainly Marsilio Ficino, Pico della Mirandola and Giordano Bruno), this book offers a new perspective on the Italian-English cultural dialogue at the Renaissance and its contribution to intellectual history. 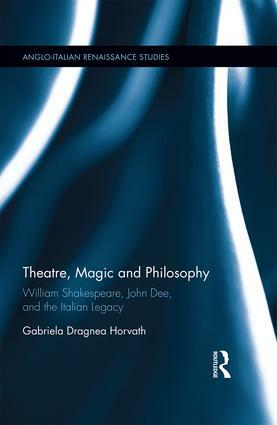 In an interdisciplinary and intercultural approach, it investigates the structural commonalities of theatre and magic as contiguous to the foundational concepts of perennial philosophy, and explores the idea that the Italian thinkers informed not only natural philosophy and experimentation in England, but also Shakespeare's theatre. The first full length project to consider Shakespeare and John Dee in juxtaposition, this study brings textual and contextual evidence that Gonzalo, an honest old Counsellor in The Tempest, is a plausible theatrical representation of John Dee. At the same time, it places John Dee in the tradition of the philosophia perennis-accounting for what appears to the modern scholar the conflicting nature of his faith and his scientific mind, his powerful fantasy and his need for order and rigor-and clarifies Edward Kelly's role and creative participation in the scrying sessions, regarding him as co-author of the dramatic episodes reported in Dee's spiritual diaries. Finally, it connects the Enochian/Angelic language to the myth of the Adamic language at the core of Italian philosophy and brings evidence that the Enochian is an artificial language originated by applying creatively the analytical instruments of text hermeneutics used in the Cabala. 6. What a Piece of Work is Man! 19. What’s in a Name? Gabriela Dragnea Horvath teaches for the NYU Global Liberal Studies Program in Florence and serves as general editor for the on-line publication Voyages-Journal of Contemporary Humanism. This series places early modern English drama within the context of the European Renaissance and, more specifically, within the context of Italian cultural, dramatic, and literary traditions, with reference to the impact and influence of both classical and contemporary culture. Among the various forms of influence, the series considers early modern Italian novellas, theatre, and discourses as direct or indirect sources, analogues and paralogues for the construction of Shakespeare's drama, particularly in the comedies, romances, and other Italianate plays. Critical analysis focusing on other cultural transactions, such as travel and courtesy books, the arts, fencing, dancing, and fashion, will also be encompassed within the scope of the series. Special attention is paid to the manner in which early modern English dramatists adapted Italian materials to suit their theatrical agendas, creating new forms, and stretching the Renaissance practice of contaminatio to achieve, even if unconsciously, a process of rewriting, remaking, and refashioning of 'alien' cultures. The series welcomes both single-author studies and collections of essays and invites proposals that take into account the transition of cultures between the two countries as a bilateral process, paying attention also to the penetration of early modern English culture into the Italian world.